I was looking at neck knives for a while as a lightweight alternative to folders. I purchased a TOPS Sneaky Pete and was impressed with it enough that I looked into more neck knives. The minimalist, at first glance, looked odd, but once I picked it up the ergonomics of the knife were amazing. The way this knife fits in your fingers as opposed to the hand is genius for a knife this size. The jimping allows for outstanding control for small cutting tasks. The biggest dilemma I had was which blade style to get as they all seem to have a specific task. The tanto blade, the warncliffe and the mini Bowie. I couldn't decide so I bought them all. I like the tanto for everyday box cutting . I used the warncliffe to process a few squirrels and fish and the Bowie is great for skinning. Of the three, my opinion is the warncliffe is the easiest to sharpen with the straight blade style. The steel is good and the edge retention is also good. Over a weekend of processing game and a bit of whittling and wood carving, they all needed a touch up on my Spyderco Sharpmaker. They came back to razor sharp in no time. The sheaths all have excellent retention without any rattle. The Bowie and the tanto sheaths are the same. The are moulded for the tanto blade but are interchangeable. The warncliffe sheath came with a break away snap in the lanyard which I really like. All in all, the light weight and superior ergonomics make this an outstanding design......if you can just pick one. I bought this knife as an EDC back up knife to the folders I usually carry and it is the perfect companion to a larger knife. The fit and finish on mine is excellent as is the feel in the hand. I find myself going for it when I have to do some more precise cutting because of its small size and easy to switch grips ergos. The blade holds an edge well for what it is and I usually do a light touch up once a month no it's not a VG or other top of the line steel but for fewer than 20 dollars I couldn't be happier. My sheath doesn't rattle at all and it is so light and comfortable to wear I forget it's there. Get one you will like it. They also make it in drop point and tanto now. I got this knife as a gift on fathers day,I uae it as an everyday carry general purpose knife.It holds an edge very well it has had only minor touch ups on a steel.I find it very easy to grip for just about any cutting tasks.The sheath fits very well,the knife is easy to remove and replace.Overall I really like every aspect. Just picked this up a few days back. The name is very appropriate as this is truly a knife paired down to the bare minimum in terms of size. Initial quality was good. One of the handle scales was slightly loose but this was easily fixed by tightening the torx-head grip screws. 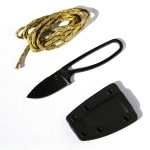 The zytel sheath allowed for a small amount of "rattle" or play with the blade inserted but retains the knife well. Holding the sheath, I attempted to throw the knife free and the sheath held the knife securely. The handle is very well designed with deep finger grooves and comfortable jimping on the back of the blade to give the thumb control. 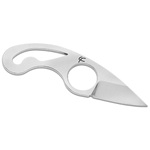 I am generally not a fan of knives that only accomodate a three finger grip, but the Minimalist's grip is different. The wharncliff style blade excells at random utility-oriented tasks such as opening packaging, cutting out articles, etc. although the 2" blade length can be a hinderance to accomplishing other common jobs such as cutting an apple, etc. The blade was shaving sharp out of the box and possesses a needle-like point that pierces very efficiently. Overall, I am very pleased with the Minimalist having carried it for about a week. I would recommend it as a good choice for an urban utility neck knife/EDC type blade.